When I was in college, my friends used to call me “little miss sunshine.” I’m sure it was ironical, at first, but somehow it stuck. Yesterday I felt more like “little miss tornado warning.” For no real reason I felt discouraged, I felt cranky, I felt like going back to bed till late May. Funnily enough, there was a tornado warning yesterday! The day was wild! It was dark and broody, with strange patches of bright sky, and just when you decided to walk out the door, brief heavy squalls of rain. The clouds raced over head, the wind rattled everything in its path. The storm is always forcast to hit right at the time I walk over to get the boys from school. But it didn’t. And we were all safe in our house, with the world wilding all around us. The boys made masks out of paper and cardboard – just because they felt like it. David and I shared a scottish beer and ate punjabi mix. I made a good dinner, and David liked it. At every little thing, my mood lifted – it’s always the little, every day things that make a person feel better. I think that must be true, no matter who the person is. No matter how stressful and important their job may be. I forget that sometimes, and it takes an effort to notice the moments that are like balm to a sore – that comfort and soothe and restore. And then…Isaac made a giant lizard mask for David. It fit him like a hat, and he wore it pushed back on his head. He stood in our small yard looking up at the dark racing clouds, at the wild, tangled branches that swayed in a pale frenzy, showing the pale undersides of their leaves. Isaac came into the kitchen to look out the window and giggled. We made two kinds of ice cream. The rain came suddenly, in a dark downpour, and we headed upstairs to read books. I’m crazy about this ice cream!! It all started when we got a bundle of lemon balm sprigs from the CSA. No – it started farther back than that, when I got a brand new ice cream maker! I’m so excited. It’s almost exactly like my old donvier, except that it has a little cage that goes round, and a motor. 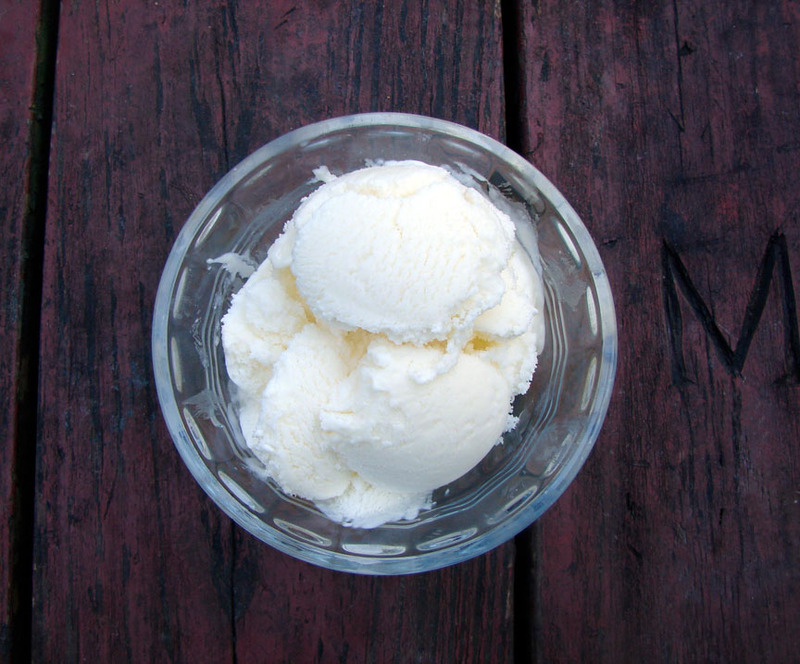 I decided to turn the lemon balm into ice cream. And I decided to use buttermilk to make it, because I had just bought a big container to make something else, which I’ll tell you about another time. Buttermilk is so lovely and creamy, with just a tiny tang. It curdled when I first put it on the heat, but it all came together beautifully when I added the eggs, sugar and flour. I steeped the lemon balm leaves in the buttermilk. So there’s a lovely lemony flavor, a slight buttermilky tang, and a beautiful creamy texture. You could easily make this with other herbs – mint would be nice. I’ve heard of tarragon ice cream, so I might try that. I’ll let you know! Steep the lemon balm sprigs in the buttermilk…warm them together in a medium-sized saucepan. Once they start bubbling slightly (the buttermilk might curdle) set them aside for at least half an hour. After that time, lift the lemon balm out of the milk and set it in a strainer over the pot. When it’s cool enough to handle, squeeze it in your hands over the milk. Discard the lemon balm, and put the buttermilk back on a burner over medium low heat. Add 1/3 cup sugar, and whisk it in well. In a medium-sized bowl, whisk the eggs, remaining 1/3 cup sugar, flour and salt till they’re light and frothy. When the buttermilk is just steaming, pour it in a thin stream into the eggs, which you will whisk vigorously the whole time. When the mixture is all whisked together, return it to the pan and return it to the heat. Turn the heat down to medium-low, and cook, whisking constantly, for about ten minutes. You don’t want it to boil. It will become thicker than regular custard, but not quite as thick as a regular pastry cream. Remove it to a cool bowl, whisking the whole time. Then pour it into a cool tupperware (or another bowl) cover tightly, and chill for at least five hours. When you’re ready to freeze it, add the heavy cream, and freeze according to your ice cream maker’s instructions. This entry was posted in dessert, recipe, Uncategorized and tagged buttermilk ice cream, herb ice cream, lemon balm, pastry cream ice cream by Claire. Bookmark the permalink. Reading the word ‘squall’ always cheers me up – it makes me think of a band called Pram and their song: Sea Swells And Distant Squalls (but I can’t find a link – boo). I love ice cream, this looks and sounds delicious. Thanks, Shane! You have a song for everything! !